This weekend was VERY busy. 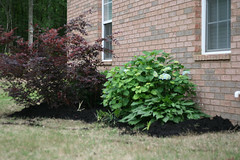 I spent 6 or so hours on Saturday putting out mulch and digging a trench around the beds. It took two yards to do the beds. Talking about tiring! By the time I got done, I was nearly black from head to toe. We also put lights in. They are the kind that are down in the flower beds and shine up. They make the house look a lot better. The big task left is to put back up the shutters. I have to order some little gizmos to attach them to the brick. They were attached with these barbed plastic things, but I broke some of them pulling the shutters off. One of the things I got Laura for Mother’s day was a tree. We’ve got woods behind us, but we’re afraid that when/if they start developing, they’ll cut the trees down. 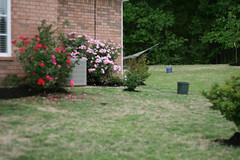 We’ll then have very few trees in the yard. 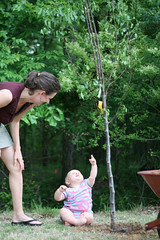 Haley helped out with planting the tree. 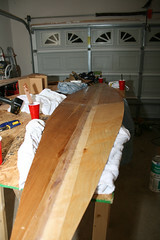 The Kayak is taking shape. I’ve expressed concern before, and I’ll do it again. I don’t know if this things is going to float or not. I’m following the instructions, but it just seems so thin! 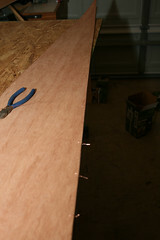 This weekend, I stitched up the bottom pieces and fiberglass/epoxy’d them together. My problem with the epoxy so far is, I ordered the “summer cure” type, which is used when it is really hot out. Unfortunately, it’s not really hot yet, so it is taking forever to harden up. At least I hope that’s the reason. I’ll keep posting pictures here as it develops.